Drawing many a crowd to one of London’s busiest squares, two world-famous paintings by none other than the Dutch Impressionist Vincent van Gogh have been reunited in Room 46 of the National Gallery for the first time in 65 years. 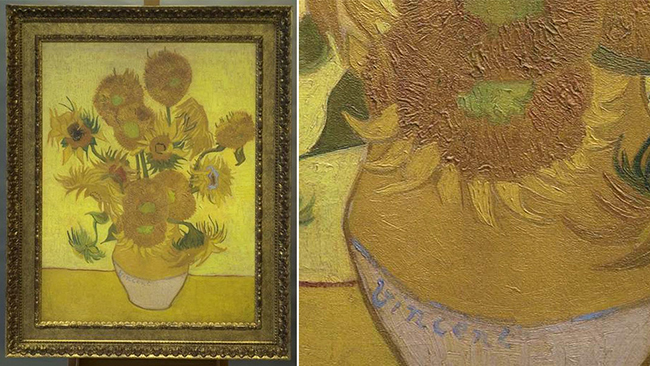 The reunion was made possible by the friendship between the National Gallery and the Van Gogh Museum in Amsterdam, who lent the second Fifteen Sunflowers (1889) for the display. With a minimum of 20 minute queues daily, what makes these two paintings so appealing? Reunited after 65 years. Image via www.bbc.co.uk. Van Gogh painted his series of sunflowers in Provence in the south of France between 1888 and 1889. The two Fifteen Sunflowers in this display come from either side of this period – the London version from 1888, and the Amsterdam version from 1889. 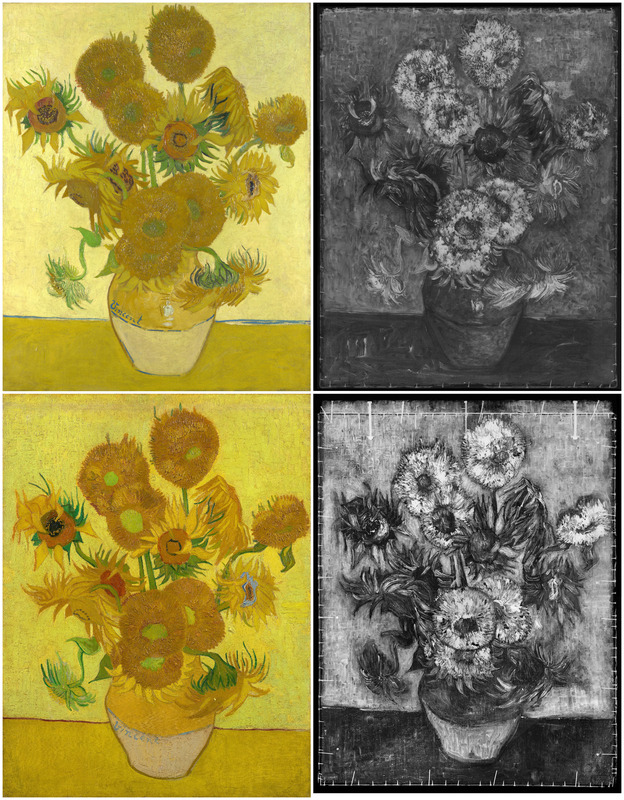 During this time, he painted five other sunflower paintings – now scattered in the collections of Munich, Philadelphia and Tokyo – making a total of seven paintings in the series. Sadly, one of these – Six Sunflowers (1888) – was destroyed in Ashiya, Japan, during the Second World War. 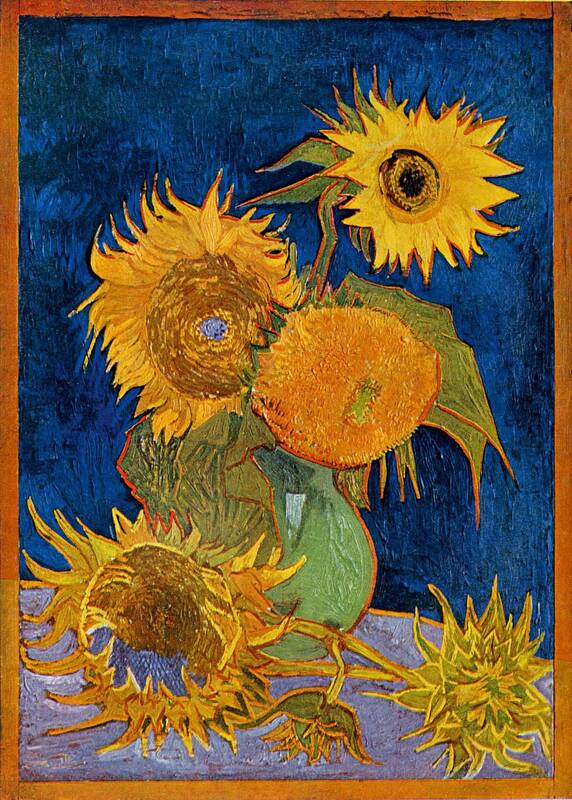 Vincent Van Gogh, Six Sunflowers, 1888, destroyed. Image via www.independent.co.uk. Walking into the dimly lit room and seeing these two paintings side by side was a bit like a game of Spot the Difference. Their compositions are entirely identical, no doubt the same bouquet of sunflowers. Both feature a distinct bright yellow background that brings out the darker hues of the sunflowers. The Amsterdam version was the result of Van Gogh’s encounter with Paul Gauguin at Arles on 23rd October 1888. Vincent Van Gogh, Fourteen Sunflowers, 1888; Fifteen Sunflowers, 1888. Images via www.wikipaintings.org. Ushered upstairs into the guest room of Van Gogh’s Yellow House in Arles, the French artist would have seen the vibrancy of the two large still-lifes hung in this room, Fourteen Sunflowers (1888) and Fifteen Sunflowers (1888). The two artists became close friends for the next two months, even painting portraits of each other – The Painter of Sunflowers (1888) and the Portrait of Gauguin (1888). Due to clashes in personality, Gauguin stormed out of the Yellow House on the night of 23rd December 1888 with Van Gogh pursuing him, who later returned home and slashed off the lower half of his left ear with a razor. Following treatment at hospital and a rapid recovery, Van Gogh wrote an appeasing letter to Gauguin during his short visit back to the Yellow House, finding the guest room bare – Gauguin had already moved out. Paul Gauguin, The Painter of Sunflowers, 1888; Vincent Van Gogh, Portrait of Gauguin, 1888. Images via www.wikipedia.org; www.techbiotic.com. 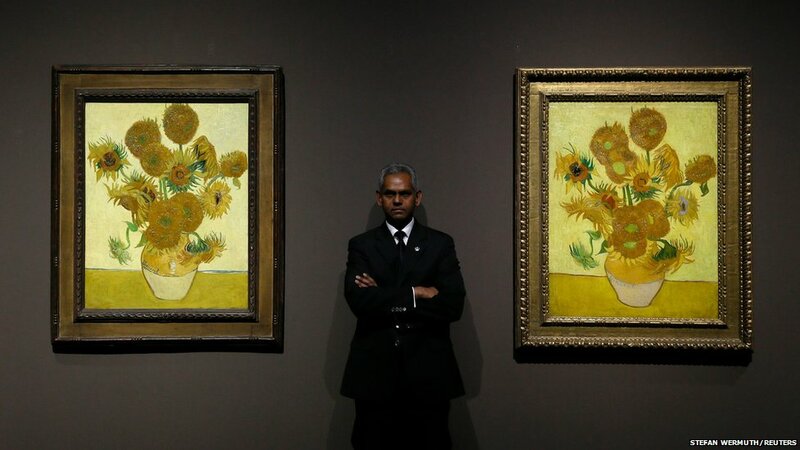 Correspondence between the two artists has suggested that the Frenchman requested for a copy of Fifteen Sunflowers, the one he had seen on his first visit, which the National Gallery acquired in 1924 for £1,304 in today’s money. The Dutchman agreed, saying in a letter on 21st January 1889 that he’ll “make an effort to paint two of them, exactly the same.” Thus was the birth of the Amsterdam Fifteen Sunflowers, subsequently sparking the creation of répétitions or copies within his oeuvre. Standing in the centre of the room, it is very easy to find small differences in each of the paintings. The vase in both works rest on a table propped up against the wall, distinguished by a horizontal outline. In the London version this is painted in blue; in the Amsterdam version it is in red. The overall atmosphere of the latter is much lighter than the former, appearing much more vibrant. In some ways the London version looks rather depressing. Whether cleaning might bring out the colours more, I cannot be sure, but the amount of detail that Van Gogh has concentrated on each sunflower is rather remarkable. A habit of mine when it comes to Impressionist paintings is to look at the paintings close-up and at an angle. Not only do I get to see the individual directions of the brushstrokes and the thick impasto, but also the way the light shimmers across the painting’s unique textured and layered surface. The effect is almost dance-like. Detail from the Amsterdam version. Image via www.slrlounge.com. Several other differences can be found such as the position of the signature and the somewhat out of place highlight of Prussian blue in the Amsterdam picture. However, one of the other advantages of this display is the inclusion of x-rays of each painting. Not only do they show the vast changes in pigments used, especially for the flowers, but also the fact that the Amsterdam picture was extended at the top edge by a piece of wood, making it roughly 3 cm taller than the London version. Both versions with their corresponding x-rays. Images via www.wikipedia.org; www.artfund.org. The opportunity to see these two paintings side by side is a wonderful privilege and I urge anyone to take advantage of this little display, especially now that it is in its final week – it ends 27th April, so be quick! 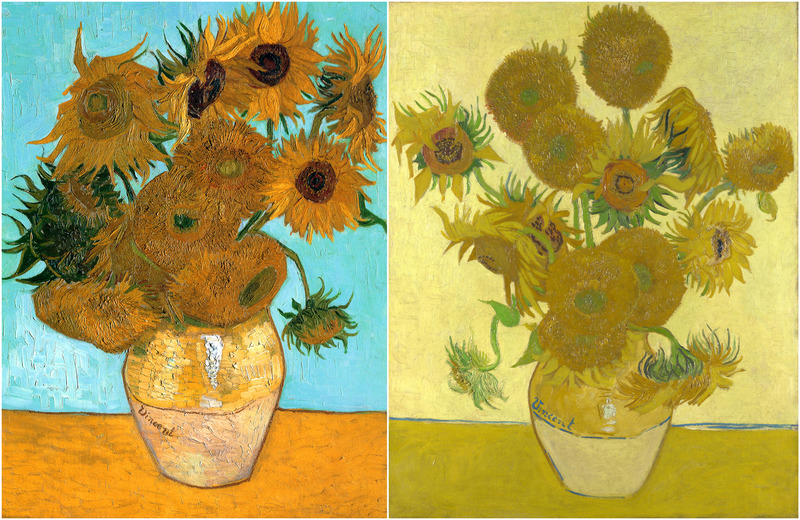 The two works, aside from being iconic as Van Gogh’s ‘masterpieces’, can be seen as symbols of friendship – the yellow hues were symbols of happiness. The London painting marks their first encounter in the Yellow House, while the Amsterdam painting reflects Gauguin’s appreciation for Van Gogh’s style, the trauma experienced by the Dutch artist on the night of the argument, and the beginning of his series of répétitions. Rich in sentimentality there is no wonder that these paintings appeal to so many people around the world. Then again, they do look rather lovely as decoration. The Sunflowers runs until 27th April 2014 at the National Gallery, London, www.nationalgallery.org.uk.